550 Flour - equivalent flours here in the States ? am trying to do this (hard rolls) recipe which is supposedly the original East German one - when no good ingredients were available. Trying to set up for receipt of answers via email. Type 550 is a measure of the ash content in the flour, and means a residue of 0.55% will remain when a sample of the flour is burnt. It doesn't give an indication of protein content or potential gluten quality I'm afraid. It is really telling you it is a white flour, at least as refined as any standard US or UK white flour. I suspect you would be looking for bread flour in the US. High gluten will be too strong. for your quick response. Bread flour I have plenty. Will try that recipe soon. Anna, for Weizenmehl Typ 550 you can use either all-purpose or bread flour. I posted a "flour translation" in my blog, here is the link. AP has a protein content of 10 - 12%, bread flour 12% and more. I would make my choice dependant on what kind of bread you are baking. If you have lean rolls with no whole grain flours added, you should better take AP, otherwise you get a French bread type crumb, German wheat rolls are fluffier. If you have a flour mixture with rye and spelt, or an enriched dough, you can also use bread flour. Süpke's recipe gives alternatives: whey OR lard and sugar OR malt. These ingredients enrich and soften the dough, as I mentioned, German wheat rolls are supposed to have a soft, fluffy crumb. Though you are right about the scarcer availability of many good quality foods in the former GDR, this does not pertain to bread and several other things. 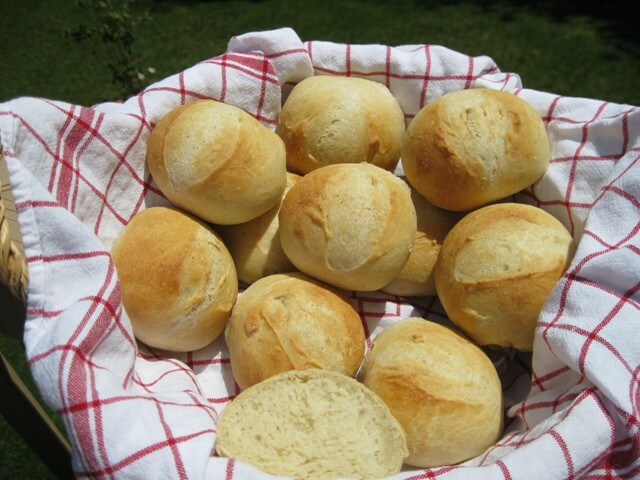 Bread and rolls had often a very good quality, and the reason that many readers of Bäcker Süpke's blog are looking for "DDR-Brötchen" is just that. After the reunion, many rolls were mass produced from frozen dough pieces, and not made from scratch in bakeries anymore. When I visited my cousin in Rostock before the reunion, I was always pleased with their bread, and also their butter, because it tasted better than the bland EU-butter I got in Hamburg. Beer, of course, was always available in very good quality, too. Divide into 60 g pieces. Shape into the desired kind of rolls. Cover, and let rise for about 30 minutes until desired size is reached (about double, I assume). Score after 50% rise, so that rolls don't deflate afterwards. Preheat oven to 428 F/220 C, including steaming device. Brush rolls with water, and bake with a lot of steam. After 20 minutes they should have the desired color. If they are baked longer they will dry out. thank you so much, Karin. Love your blog, I finally migrated mine, maybe I will get serious and start adding to it, grin. if you leave a link, Anna. the East German (DDR) Brötchen (buns/rolls)recipe by Chef Süpke. I am very very happy with the results and ate one still warm with soft butter which sank right in. Oh yum. I tried this particular recipe to bring back memories of the hot buns that the bakery put into the linen sack hanging from the second floor window to the street in Gera, my hometown in the former East Germany. That was 65+ years ago and sorry to say, I truly do not remember what they used to taste like, but my creation tastes beautiful :) Karin, fwiw, I used malt and a bit of Crisco.